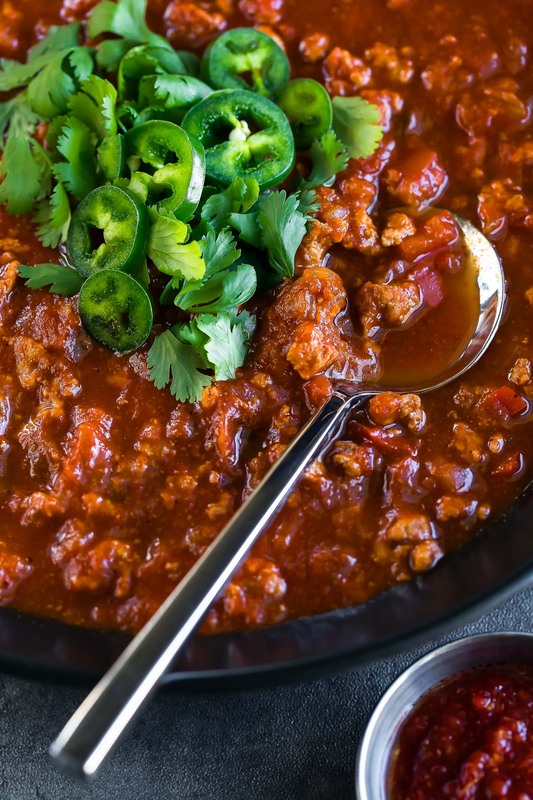 Instant Pot chili is one of the best perks of having a pressure cooker and this Spicy Harissa Turkey Chili recipe is one for the must-make list! This crazy flavorful one-pot chili can also be made on the stove top and is quick and easy enough for busy weeknights. I’ve been crazy obsessed with all things harissa lately. Have you tried it? It’s a chile sauce that totally has a Sriracha vibe but with a wonderfully versatile flavor profile all of it’s own, spiked with aromatics like garlic, coriander, and caraway. Some varieties are ultra-thick and spreadable while others are blended with extra olive oil making it ideal to swirl into everything from sauces to soups and also great for marinating protein and veggies destined for roasting. Love. It. So. It’s safe to say that if a restaurant has harissa-anything on their menu, I’m going to order it! (Zoe’s Kitchen has a Harissa Salmon that gives me LIFE, I tell ya!) I’m also always on the lookout for fun ways to feature it in my recipes. 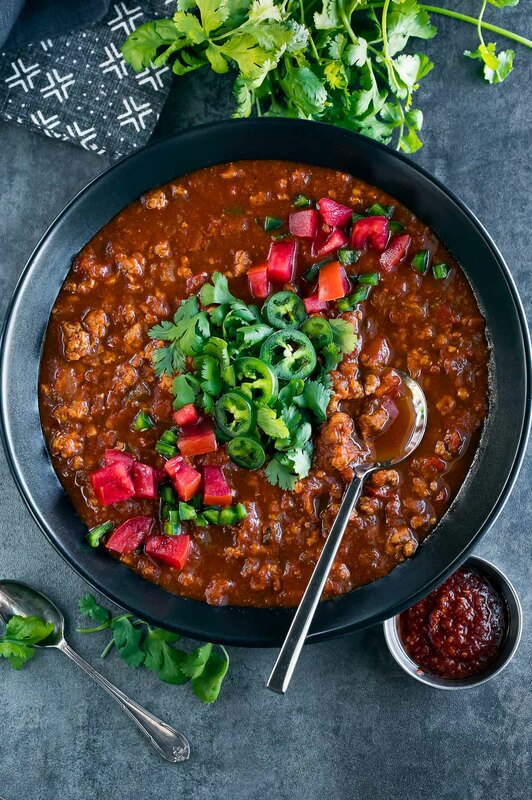 So far I’ve shared a harissa-spiked dressing recipe and today we’re diving face-first into this crazy-good Harissa Chili! I’m pretty sure the next step is to start making it on my own harissa (bring on the chile peppers!) so I’ll totally update y’all on that adventure when it goes down. This concludes my daily foodie ramble. What time is it? It’s recipe time! So everyone can get a bowl of this deliciousness in their faces, I’ve included instructions for both the Instant Pot and a good old fashioned stove top recipe too. This one pot wonder can be made in a dutch oven too! Serve this up as a filling dinner for two or divide it into 4 side-dish sized portions to pair with a leafy green salad or veggie burger! We’ve made it twice already and matter how you serve it, this scrumptiously spicy chili is sure to rock your taste buds! Recipe yields 2 large meal-sized servings or 4 smaller sides of chili. First up are the Instant Pot pressure cooker instructions. For stove top instructions, see below. Chop your veggies and measure out all ingredients for speedy chili assembly this one comes together quickly! For the jalapeños, I remove most of the seeds but leave some in to make mine spicy. You can use the seeds, cayenne, and harissa to adjust your heat level from slightly spicy to totally fiery! Sauté onion for 3-5 minutes, until edges are golden, adding garlic towards the end. Next move the veggies to the side and add your ground turkey. Sauté until crumbled and browned. Add remaining chili ingredients: chopped red bell pepper, chopped jalapeño, harissa paste, chili powder, cumin, oregano, paprika, cayenne pepper, tomato sauce, salsa, and veggie broth. I saved some of the bell pepper for topping my chili, feel free to do the same if you'd like! Stir it up and make sure nothing is sticking to the bottom of your pot. Switch IP off, then set to HIGH for 8 minutes with lid and vent sealed. Allow a spoonful to cool, give it a taste, and adjust spices if needed. You may also season with salt and pepper to taste if desired. I wound up adding just a pinch of salt and pepper and an extra spoonful of harissa to make mine spicier - YUM! Grab a large pot and bring to medium-high heat with 2 TBSP oil. Brown turkey until medium rare but crumbly, then add onion, bell pepper, and jalapeño. Cook until softened, approx. 3-4 min, adding the garlic towards the end. I just push my turkey to the side and add the veggies, but you can also remove it from the pan and add it back in with the spices if desired. Next stir in your spices, harissa, tomato sauce, salsa, and veggie broth. Bring to a boil then reduce to simmer, stirring occasionally. Cook until chili is fragrant and veggies are tender approx. 20-25 minutes. Season to taste and add any additional harissa you'd like to increase the heat of the chili. Pile on your favorite chili toppings and dig in! No salsa? No problem! You can use canned crushed/diced tomatoes in place of the salsa in a pinch! I've made this recipe both ways and, though unconventional, the salsa is just awesome here! I used our current obsession, Mateo's Gourmet Salsa. Fantastic and flavorful! I’m reallllllly digging the swirl of harissa in this spicy turkey chili. Usually with my chili recipes I add a tablespoon or two of tomato paste to add a richer tomato flavor to the base but honestly, with the harissa present it wasn’t even needed! Those of us always scrambling to use up the remainder of the open jar of tomato paste are cheering. No tomato paste! Whoooooo! 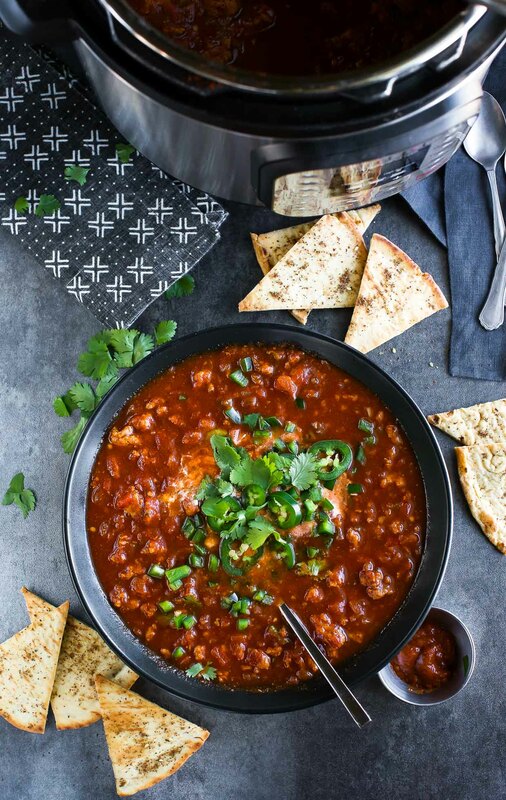 This harissa-spiked chili is fantastic served with a fluffy hunk of cornbread or fluffy pita bread (skip if keto/paleo/GF) and a mountain of all your favorite chili toppings! I like to let the harissa shine through here and keep my toppings pretty simple, but you can certainly go nuts with your usual arsenal of goodies if you’d like! It’s hard to turn down crunchy corn chips or a dollop of sour cream when the mood strikes! 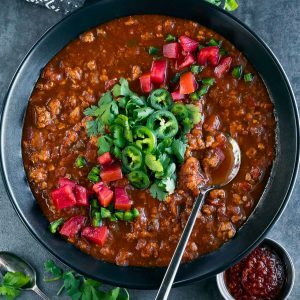 If you get a chance to try this spicy harissa turkey chili, let me know! Leave some love in the comment form below or tag your photos with @peasandcrayons on Instagram so I can happy dance over your creation. Leftover chili? That’s cause for celebration! 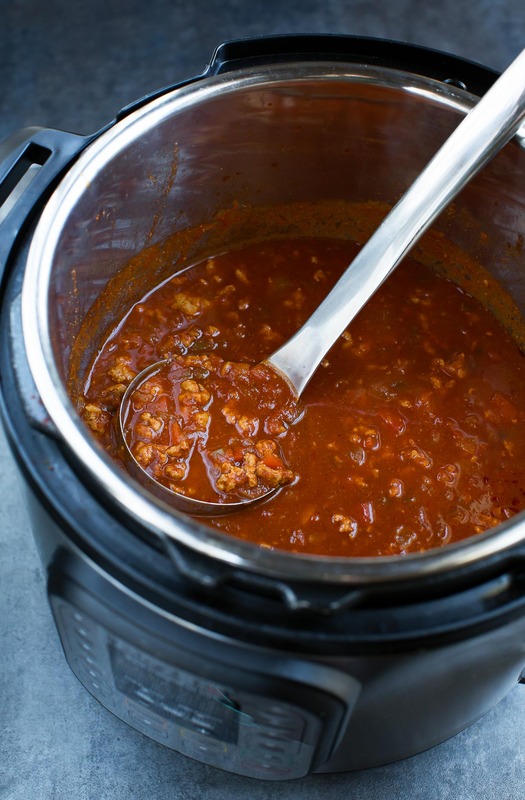 Here are 7 Delicious things to do with Leftover Chili <—#5 is my FAVORITE! I love Harissa so much! Have you tried making your own harissa paste? Or do you prefer buying it? Thank you for sharing! This looks absolutely delicious. Can’t wait to try it at home. Hey Billy, thanks! I haven’t tried making it yet but ohmygosh I want to!! It’s for sure on my must-make list now that I go through it so frequently. Hope you get a chance to try the chili!